Toole, UT – (June 22, 2011) Ryan “Fluffer” Hagy, Freestyle MX rider and Director of Metal Mulisha clothing, will be debuting the “Ox” brand SuperLite truck at the Lucas Oil Off-Road Race June 25th and 26th at Miller Motorsports Raceway. In addition to the truck debut, this race marks Hagy’s debut and entry into off-road racing. The “Ox” brand SuperLite is a race team that has been started to honor the memory of Off-Road/Freestyle MX/Baja MX racer Jeff “Ox” Kargola. Kargola was establishing a promising racing career in the LOORRS series until his tragic accident in Baja April 29, 2011. In the spirit of Kargola’s passion for racing, the “Ox” brand truck will race in his memory with close friend Ryan “Fluffer” Hagy in the driver’s seat. The “Ox” truck will be a sister truck to Kargola’s SuperLite race truck. The design of the truck is inspired by Kargola’s new 2011 design. 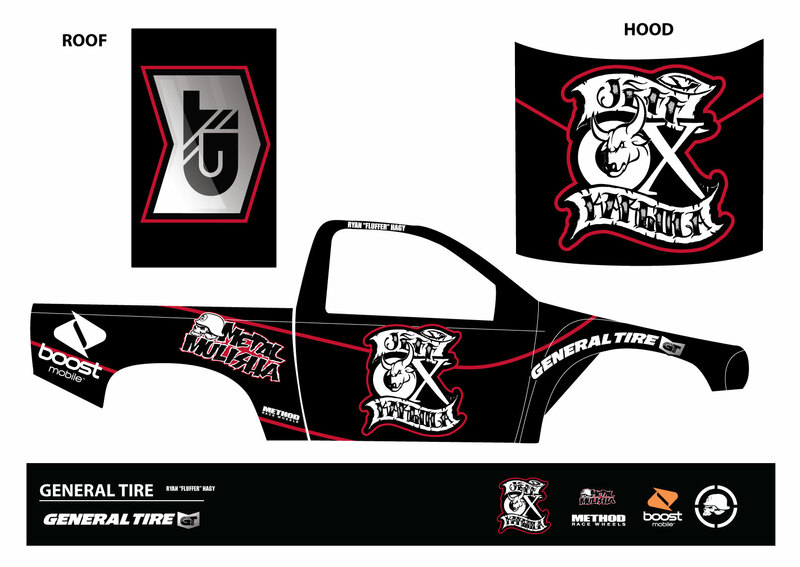 Kargola’s sponsors, General Tire, Metal Mulisha, Boost Mobile and Method Wheels, will be sponsoring Hagy’s “Ox” race truck for the Miller Motorsports Race. The doors and hood of the race truck will display the Jeff “Ox” Kargola logo that is featured on the Metal Mulisha Jeff “Ox” Kargola Memorial fund shirts, sold at www.metalmulisha.com/ox with all proceeds going to help support the San Felipe Hospital in Mexico. Kargola’s race truck will be on display at the General Tire booth at the LOORRS races this season. Jeff “Ox” Kargola touched so many people’s lives with his vivacious smile and inspirational attitude towards life. His mission on this earth was not complete and his supporters are committed to keep his “Ox” brand as a symbol of living life to the fullest and continuing to inspire, encourage and help in areas that need our support and attention. “Ox” is not just a logo, it’s a symbol of no regrets, passion, and taking advantage of what life has to offer.